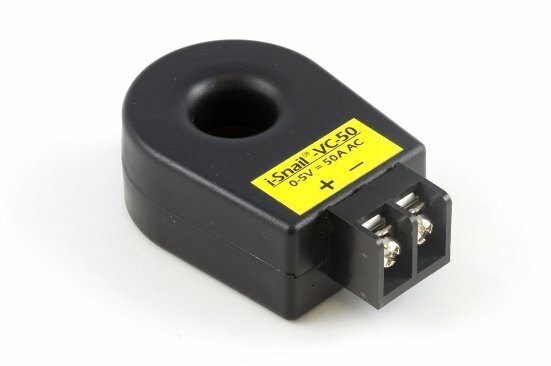 The i-Snail-VC is a self powered AC current transducer that provides a 0-5V dc analog signal proportional to the AC current flowing through the device wire window (sine wave RMS calibrated). 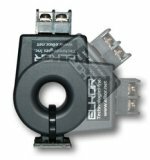 The i-Snail-VC is ideal for load monitoring without the need for an external power supply. Factory calibrated, fixed ranges ensure superior accuracy and eliminate configuration and adjustments in the field, saving time and avoiding confusion. Color coded labels allow for easy identification of full scale range. The 13.7mm (0.54") wire window accommodates a conductor up to AWG #2. Multiple turns of the primary wire may be used to alter the input range. Output voltage is clamped at 6.5V, and the unit delivers a linear output up to 120% overload (6V). Note: The i-Snail current transducer measures the current in a single AC wire (either the positive or the negative). If you put the whole cable through the window the + and - wires will cancel each other out and the sensor will read a null current value. 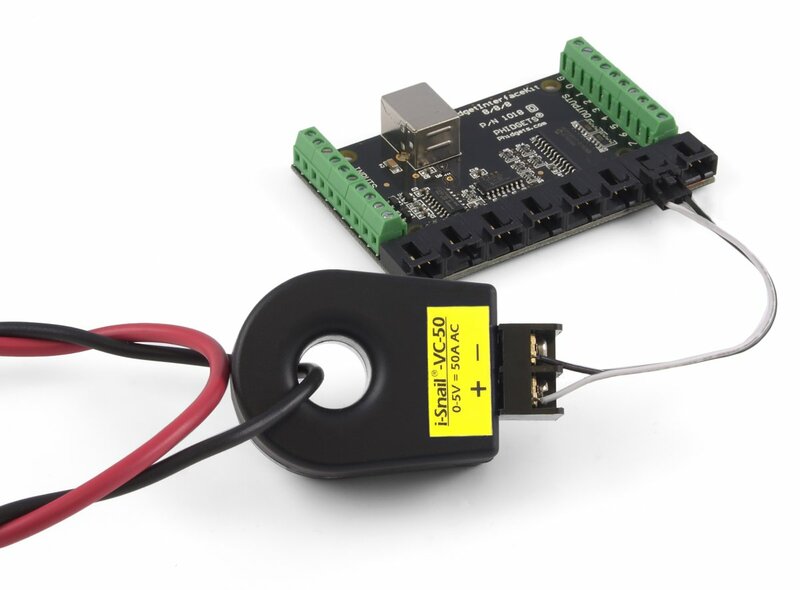 This sensor connects to a Phidget InterfaceKit or Hub with a voltage input. See the Connection & Compatibility tab for details. This sensor can be read by any Phidget with an Analog Input or VINT Hub port. It will connect to either one using a Phidget cable; see the diagram in the Phidget Cables section below for wiring instructions. 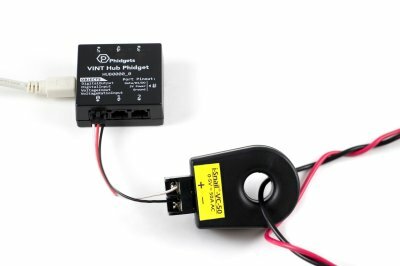 VINT Hub ports can behave just like Analog Inputs, but have the added flexibility of being able to be used as digital inputs, digital outputs, or ports to communicate with VINT devices. For more information about VINT, see the VINT Primer. To easily connect this sensor to a Phidget we recommend you use a Phidget cable. Just snip off the connector from one end of the Phidget cable and connect the ends to the sensor as shown below. You can solder multiple cables together in order to make even longer Phidget cables, but you should be aware of the effects of having long wires in your system.